“We are unable to go home because the roads are closed as a result of the military operations there,” said Zawar Hussain, a final-year student from FATA’s Kurram Agency, once a popular tourist destination. Thousands of students who had ventured to their hometowns in FATA for the Ramadan season and the festival of Id-ul-Fitr on Aug. 28 are stranded, waiting for the security situation to improve so they can travel back to Peshawar and resume studies. “Since 2005, the militants have forcibly closed down about 800 schools, leaving thousands of girls and boys unable to attend classes in a territory where the literacy rate is less than 43 percent,” said Omar Ali, a senior FATA education official. Ali said the parents are extremely concerned about the future of their children and those who can afford it were migrating outside FATA in order to ensure that their children get an education. An estimated 400 public health centres in the FATA and Khyber Pakhtunkhwa have been destroyed by militants as part of their campaign of sabotage, targeting government installations. “The majority of FATA residents now travel to Peshawar and other safer cities to seek treatment even for minor ailments,” said FATA’s director of health Fawad Khan. Khan said that before the militancy started up FATA had a good health infrastructure with an average of 250,000 patients examined and about 29,000 operated upon each year. Khan said that doctors, nurses and paramedics are now afraid to go to work because of the rising incidents of violence. Former secretary for security in the FATA, Brig. (retd.) Mahmood Shah, told IPS that Pakistan has paid heavily in monetary and human terms through the war against the Taliban. “The government needs to scale up military operations and kill all the miscreants to provide peace to the residents there,” he said. 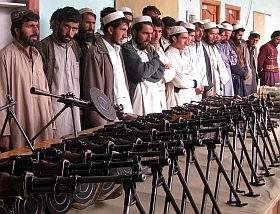 “The Taliban want to enforce their own brand of Islam. The government can defeat them with the public support which it is getting now,” said Shah. “The fight against terrorists must continue till their elimination for the safety of our people, our country and our region,” he said. “After Osama bin Laden’s assassination, the wave of terrorist strikes has increased as the Taliban are now targeting mosques and market places in an effort to kill as many people as possible,” said Afrasiab Khattak, senator and president of the Awami National Party that rules Khyber Pakhtunkhwa. Khattak told IPS that all the players involved in the tribal areas, including Pakistan, the U.S. and Afghanistan, should “give up their dual policies if they are sincere about resolving the imbroglio in the region.” Pakistan, Khattak said, should revisit its policy on the “war-on-terror” because the country has paid a heavy price for “flawed policies” that pandered to the military interests of the U.S.
“We totally reject the U.S. notion of good and bad Taliban. All are animals. They don’t have any respect for humanity,” Khattak said. “A vigorous military operation in FATA is extremely important to kill the terrorists based there since one decade. “We have long been asking the U.S. and NATO to leave Afghanistan and let the people decide about their future,” Khattak said.